I think you’d better do what he says, Mr. Kinney…. I really hope that the inspiration behind this is clear, but if not, you need to check this out… do it now people – you have 20 seconds to comply. The first thing that came into my mind was the Old Space Crusade Chaos Dreadnought. And that is not a bad thing. The ED209 thing only after you pointed it out but that says more about my fondness of the old Chaos dread than anything else. Over to some (hopefully) conscructive criticism – I think the legs and body works really well. The engine block is so cool. You might want to add something underneath the canopy. It feels a bit unfinished at the moment. The main “problem” is the arms. I would rotate the gun so the mag points either straight up or straight down. That would help alot, I believe. The guns are pointing in a strange way at the moment. the second thing with the arms is the shoulder joint. It still looks a bit too much like an arm glued on in odd way. I would try and cover it up with som armour, wires and stuff like. In order to incorporate the arms more into the whole of the robot. For me, the problem is the canopy comes to an abrupt stop at the front. Underneath needs something added…chin turret perhaps? Also, and this is a tricky one to fix, is the aesthetic of the two elements i.e. legs & body are too dissimilar. Bulking up the legs (as you mentioned) and/or making the body more mechanical looking would fix that. You might want to change the pose a little too if can be arsed. Lift one leg, so that it looks like it’s walking? Change the orientation of the body and/or arms? But overall, this Dread looks ace! Great concept in the works. Let’s see how it looks after playing with the arm positioning & leg armour – fingers crossed! I thought Ed straight away! Which is a good thing and then when you sent me to YouTube I had a RoboGasm! Haha. Great stuff mate. The gun arms look terrific. I think the legs do look a little skinny from the front but not from the side. I know that’s not very helpful. I’m loving the whole project though man and I have faith in your skills to make it all work perfectly. 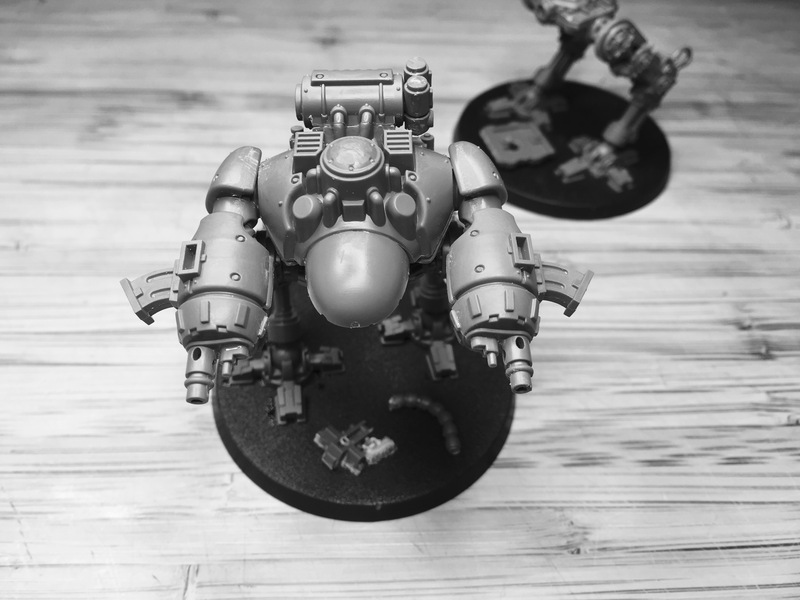 Oh and the Dreadtober thing (which I know you’re not technically apart of) does state that this year the model doesn’t have to be a dreadnought just that kind of size. New rules this year I think. Ask Tommy Gun. He knows all about it. Keep up the great work and two posts a week excites me hehe. Thomas above said it all ! I’m handing in my Robocop Fan Club card for not spotting that the Castellax arms are so perfect for an ED before now. I speed painted a Space Crusade chaos dread as an ED homage a few years ago, although keeping the weapons separate and magnetised compromised the look a bit. I think that the legs in your model are currently too spindly Alex. They could do with being chunkier, full of noisy servos like in the movie. Yep, I hear you regarding the legs – I’ll be working on them over the next few evenings. Loving your SC Dread btw! 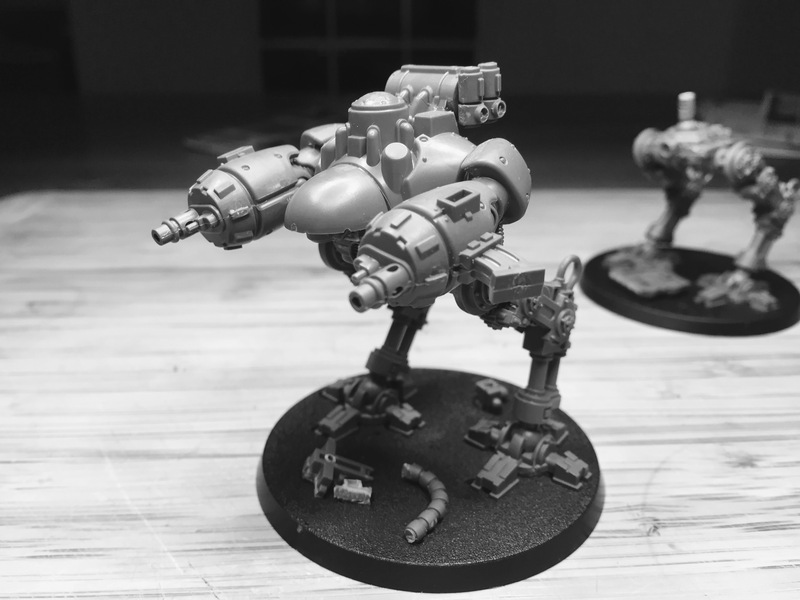 Being magnetised, (smart move), it should be easy for you to try out a new pair of arms… I think that would look superb! First of all, man, I must say this is inspired. Kudos to you! I tend to concur about the head/canopy; as soon as you fill that space, it will look amazing. So whatever you decide about the legs will be OK. Excellent idea – and nice to see ED209 demonstrating the approved Imperial technique for fulfilling the role of ‘good cop’. I actually really like this, it reminds me of some of the older dreads from GW’s early history and I can quite imagine some magus finding the designs for ED209 in a vault somewhere and – after showing his superiors that clip – being granted immediate sanction to build a fleet of them for the arbites public relations division. In terms of constructive criticism there is something slightly awkward about the pose and I think it’s the fact that the upper body looks quite sleek and fast whilst the legs are quite static. Part of what makes ED209 sinister is the way it moves, like an animatronic dinosaur, an effect emphasised by that big, blunt low-slung head (in fact now I think about it doesn’t it look like a tiny Warhound?). So perhaps a big blocky head, slung beneath that curved canopy, would make it look more aggressive and ready to lunge? 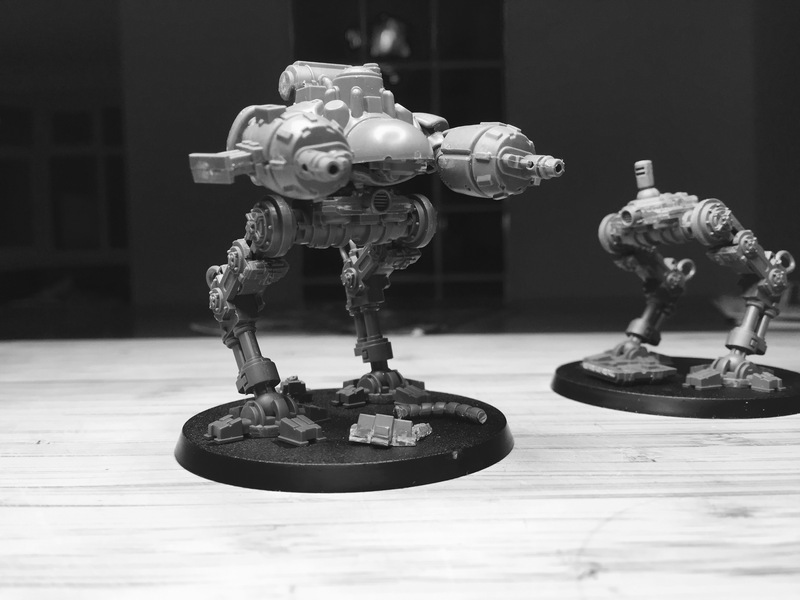 Thanks mate – yeah, ed is a bit Warhoundy isn’t he! Good shout! 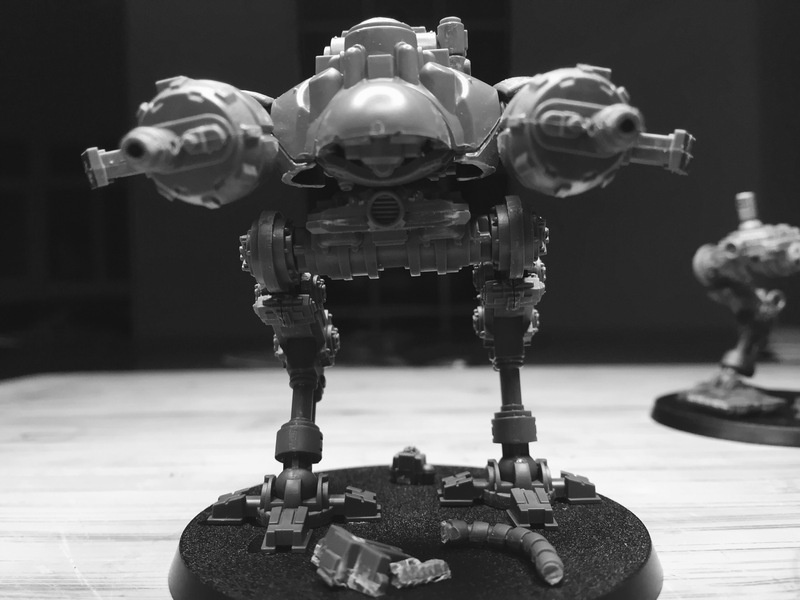 Mate, I think it looks great… I immediately thought of ED209 and about 1 second later the old Space Crusade dreadnought. The legs could be bulked up to make it look more like ED209 but they don’t have to be, it’s not an exact copy after all! Great stuff. Great conversion on him, both for the ed209 (which looks ace) but also the classic robot. He reads loud and clear as ED209. You say it isn’t a perfect replica, but I think it’s a beautiful 40k interpretation! I agree that the legs are a bit skinny on the front. 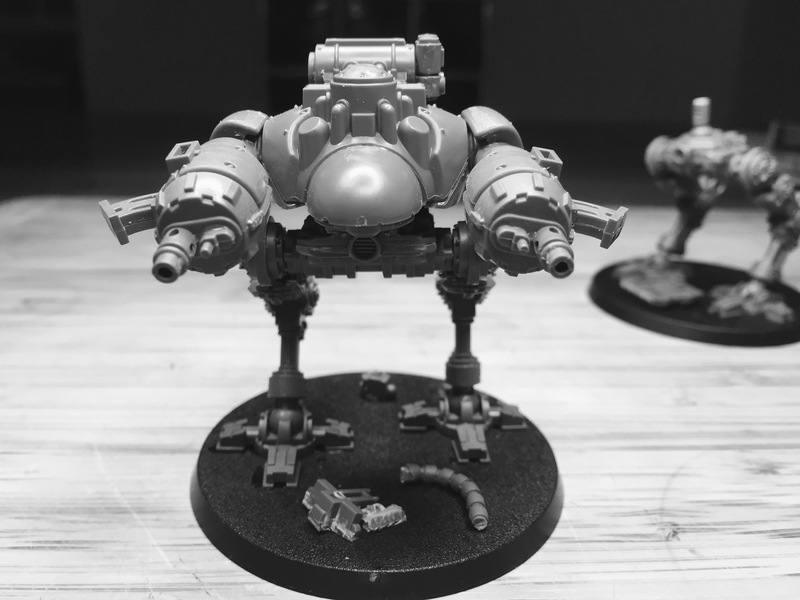 The Mechanicum walker (the Dali looking one, not the spider-tank) has some armor plates on its legs that may come in handy to add some extra bulk. It will also be easy just to greeble it up with plasticard strips and pipes!